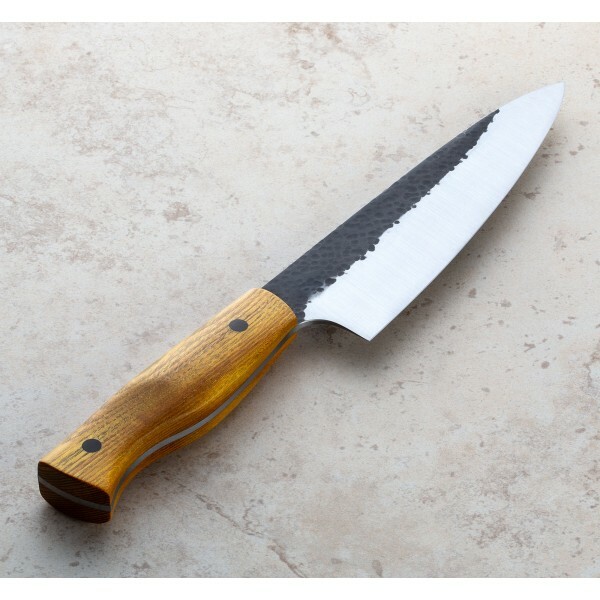 Striking osage orange wood is fastened with custom made carbon fiber pins to form the comfortable, hand-hugging Wester style handle of this petty chef by Ben Tendick of BRT Bladeworks. 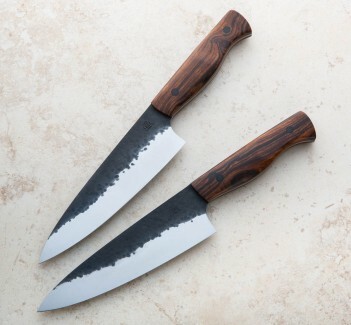 Ground from 52100 carbon steel, the 160mm / 6.3" blade features a thin, sharp, toothy edge and stiff, workhorse geometry in a size perfect for every cutting need in any kitchen small or large. With a beautifully contrasting kurouchi blade finish Ben finds his usual balance between simple, elegant design and function-first form. Ben Tendick of BRT Bladeworks is a designer and self-taught knifemaker, crafting kitchen cutlery, titanium cookware and utensils and other tools at his shop in Eugene, Oregon. Clean, simple, function-first designs and an eye for the materials, textures and sutble elements of style that make an object more than just a sum of its parts is what makes Ben's tools so unique. 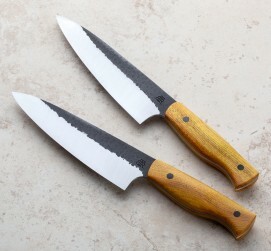 Blade length: 160mm / 6.3". 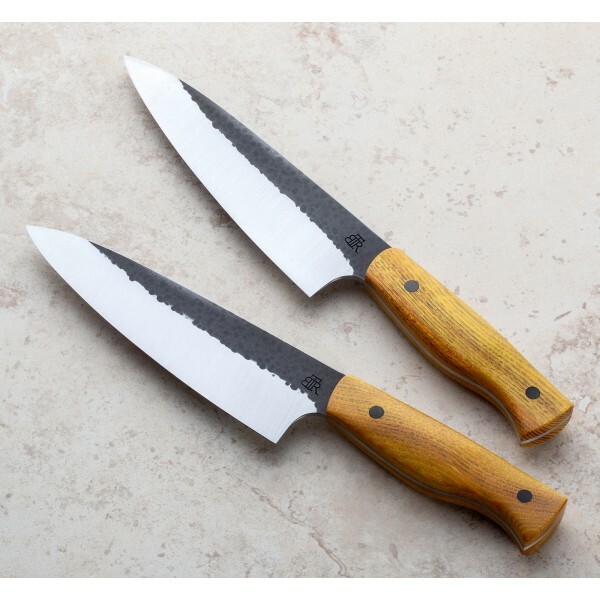 Overall length: 275mm / 10.8". Blade width at choil: 2.3mm. Blade wiidth 1" from tip: 2.2mm. Blade height at heel: 45mm. Weight: 5.4oz / 154g. 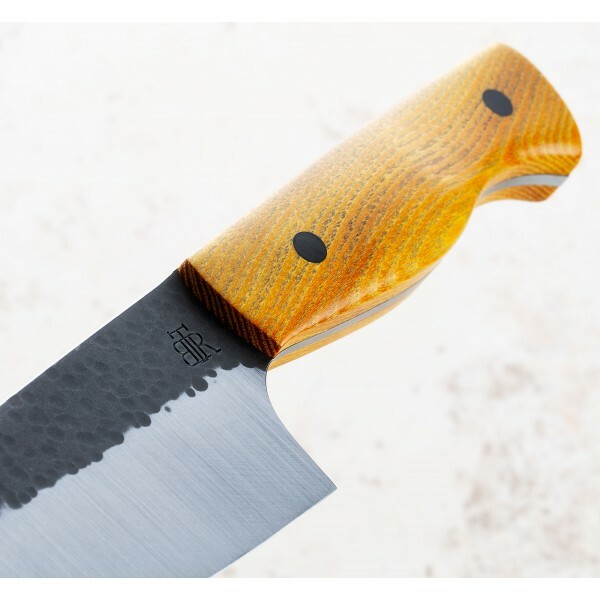 Blade: 52100 carbon steel with kurouchi finish. 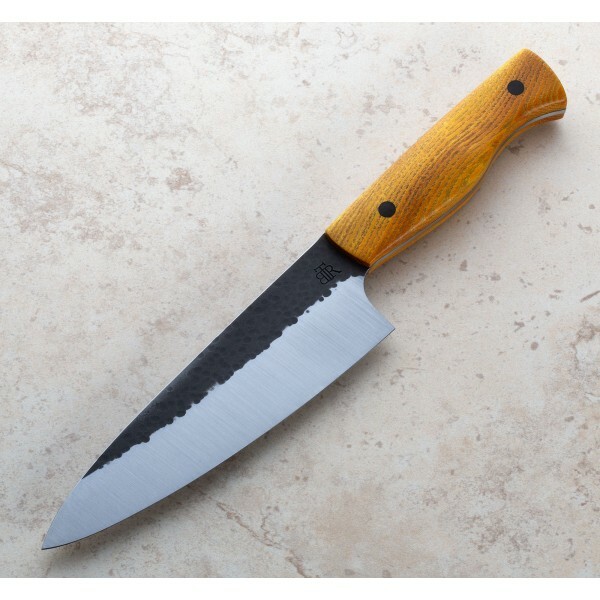 Handle: Osage orange with carbon fiber pins.